David Whitworth, Carlisle's Jackson, Tenn., plant manager, presides over a tour of the facility for participants in the Association of Rubber Products Manufacturers Environmental, Health & Safety Summit. JACKSON, Tenn.—Throughout the Association of Rubber Products Manufacturers Environmental, Health and Safety summit, one statistic kept popping up: 90 percent of injuries are avoidable because they are a result of unsafe, careless or fraudulent behavior. So naturally Carlisle Companies Inc. targeted behavior in its company-wide approach to safety, which made its transportation products tire plant in Jackson the perfect host for ARPM's annual event, held July 25-26. The system focuses on placing the emphasis on safety at the hands of the people who are in harm's way—the employees. "Tire press operators, tire builders, day in and day out perform the same operations, the same tasks," said Jackson's plant manager, David Whitworth. "They might not think about that one instance where they think they do something, and they think it's safe, and they get hurt. That's how accidents happen. "When you do something, and you don't get hurt, it just reinforces that what you did was safe and the right thing." 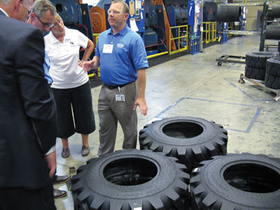 The Jackson plant has been producing semi-pneumatic and pneumatic tires since 2010. The factory's long-term focus is to lower its incident recordable rate to zero. Whitworth knows what it takes to get there. During his time with PolyOne Corp., he oversaw a period of two and a half years without an Occupation Safety and Health Administration recordable incident and almost six years without a lost time incident. The plant engaged employees from the beginning, establishing a safety committee solely of volunteer hourly employees. The environmental, health and safety coordinator attends meetings, but they are driven by workers on the floor. The committee discusses opportunities to improve safety throughout the plant, whether it is through awareness or hands-on activities. For example, the committee will walk the floor and ensure all the fire extinguishers are in the right place or that the plant has all its chemicals labeled and addressed properly. The factory also rolled out daily preshift meetings where employees were required to stretch before their shift—decreasing the chances they'll sustain a strain. During that time, team leaders highlight safety and go over any incidents that may have occurred during the previous day or shift at the plant. Safety is also emphasized in employees' quarterly bonus, which maxes out at 3 percent per quarter. The biggest portion is safety at 1.1 percent. "It's all about awareness," Whitworth said. "If you don't have a good safety culture, you have to make more people aware. We still have a lot of work to do, but the awareness was the main issue we had starting out. We've overcome that and are going to drive it to the next level." Behavior is where Carlisle is trying to push its safety program further. In February, the Jackson team leaders convened at Carlisle's plant in Clinton, Tenn. They were trained and certified in the behavior-based program that the Clinton plant already had rolled out. The plant began the process of identifying steering committee and assembling training sessions for an observation team—both consisting of and driven by hourly employees. The program is designed for employees to conduct a five-minute observation of their peers once every month and examine how that employee practices safe work habits. Whitworth estimates that of the 500 employed in the facility, 430 are hourly. "What we'll do from here is take about three or four months of data and roll it up into our software to give us a better understanding of whether or not we're performing well in the criteria we have," Whitworth said. The obvious challenge is that when employees know they are being observed, they change their habits. But Whitworth said that is the idea. If employees alter their behavior, even for five minutes, that change will get in their mind. The process becomes a constant reinforcement. "I think it's critical to be successful with behavior-based safety that we don't just think of it as a mindset, but that we also apply data to it," said Kirk Bowman, director of research and development at Carlisle. "So to go out and make the observations and collect the data so that we can effectively say, here are the most important things to work on, and here is the data that supports it," the executive said. "That gives credence to all the things you're asking people to think about on a day-to-day basis." Jackson is on target to meet its 2013 goal: Reduce its incident recordable rate by 20 percent. "I have a pretty good gut feel that we are headed in the right direction based on conversations with employees and the types of questions employees ask when I go on the floor and in communication meetings," Whitworth said. "We have a good gauge on how we're performing by basically talking with others."